CBO Report Warns Of Long-Term Debt Problems : It's All Politics The good news is that the Congressional Budget Office projects the budget deficit will shrink in 2015. The bad news? After that, deficits will gradually rise. 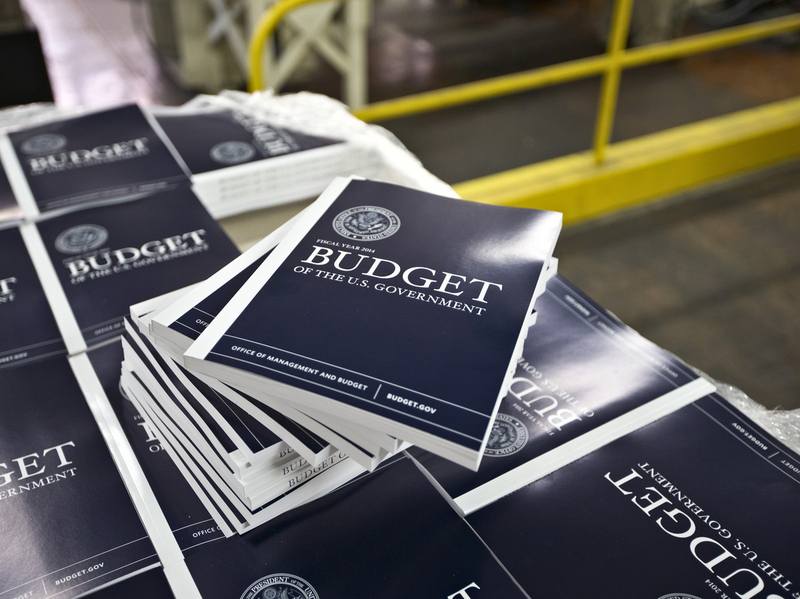 Copies of President Obama's proposed budget plan for fiscal year 2014 are prepared for delivery at the U.S. Government Printing Office in Washington in April 2013. There's plenty of fodder for deficit hawks in a new report from the nonpartisan Congressional Budget Office. In short, the future looks grim. The 2013 Long-Term Budget Outlook finds that although in the short term the deficit is expected to decline, it will grow again — and, ultimately, in a big way. First, the good news: The CBO projects the deficit will shrink to $378 billion in 2015, or 2.1 percent of the size of the overall U.S. economy. Compared with just a few years ago when the budget gap ballooned as a result of the recession, this marks a nearly unprecedented improvement in the deficit picture. It's a rapid decline in budget shortfalls not seen since the end of World War II. The national debt will bottom out in 2018, at 68 percent of GDP. The bad news: From there, the picture gets decidedly less rosy. Budget deficits gradually rise, "mainly because of increasing interest costs and growing spending for Social Security and the government's major health care programs (Medicare, Medicaid, the Children's Health Insurance Program, and subsidies to be provided through the health insurance exchanges)," says the report. By 2038, the national debt will reach 100 percent of GDP. "With such large deficits, federal debt would be growing faster than GDP, a path that would ultimately be unsustainable," the report says. There's actually not a lot new here. 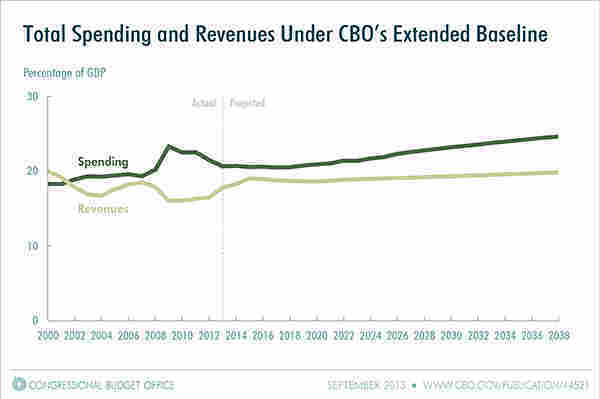 The CBO has been projecting long-term debt problems for some time now. Interestingly, the rise in health care costs has slowed recently, but that improving picture was offset by the permanent tax changes put in place by the fiscal cliff deal.